Pammy Blogs Beauty: A Holistic Natural Approach to Skincare: Lets talk about LATHER! A Holistic Natural Approach to Skincare: Lets talk about LATHER! Exploring and trying out skincare is one of the reasons that I got into blogging! I am certainly a skincare junkie, lol! Great skincare products really do excite me. Especially when I dive into a new (to me) brand and just start exploring. Well, my lastest skincare-crush? LATHER!!! LATHER certainly does live up to their trademark tagline "Clean Skin for a Radiant Life"! LATHER is an co-concious brand with a holistic and natural approach to skincare. They source natural and organic ingredients and combine them with essential oils to create products that work naturally and provide aromatherapy benefits. They also use recycled packaging materials and have in-store recycling programs. Plus, they work with non-profits like "Clean the World" (gives soap to people in need) and the National Headache Foundation to give back! Isn't it nice to know that a skincare brand that you have grown to love...is worth loving for their environmental-friendly and humanitarian practices! My introduction to LATHER skincare: Lets talk products! To get started with LATHER, I tried out a variety of facial skincare products. To find out how I like LATHER's Toning Eye Gel with Vitamin K, Ultra Mild Face Wash, Facial Polishing Powder, and the Daily Defense Facial Sunscreen, click "read more" below! Before diving into this review any further, lets just quickly talk about my skin type. I have "classic combo" skin...it is normal-dry in the winter with some slight oil in t-zone and in the warmer months, it leans from normal-oily. I do not break out that much. However, I do get some spots on occasion around my nose and on my chin. When I am smart with my product selection, breakouts are rare! I am 40-years old. So, I am certainly also interested in anti-aging skincare! I am lucky that I don't have any major lines nor wrinkles yet. However, I do have some fine lines that crop up around my eyes when my skin gets dehydrated. My biggest skincare woe? My super-duper dark under eye circles. Alas, I have allergies, hereditary circles, and I have a 1-year old and 3-year old that occasionally keep me up at night. I am *so picky* about facial sunscreens! Really, I am. Often they just leave me too shiny, or the sunscreen ingredients irritate my skin, or they break me out. Well, not this one! 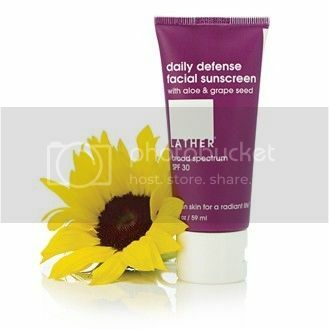 I am absolutely in LOVE with this Daily Defense Facial Sunscreen from LATHER! First of all, it has my "ideal" SPF ingredient combo: Titanium Dioxide and Octinoxate. This sunscreen provides just enough moisture while also prepping my skin for makeup and protecting me from the sun. I apply after cleansing, toning, and using serum in the mornings. I use about a "double pea" sized amount for my whole face (and use any excess on my neck). I like how this sunscreen feels on my skin...it is not greasy at all and it has a very natural and pleasant scent. I adore this and it has become an everyday staple for me! I think it is perfect for the warmer months when I don't need my daily sunscreen to be heavy-duty moisturizing. The foundation of any good skincare routine is a gentle, yet effective, face wash. The trick is that a face wash needs to get your skin completely clean without overstripping or overdrying your skin. 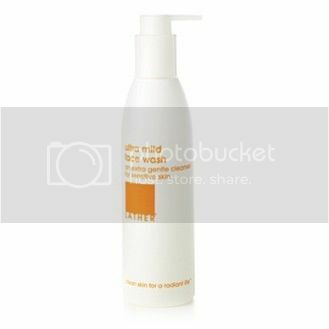 I have found that gentle face washes can calm my skin and decrease redness and blotchyness. This awesome cleanser from LATHER gets my skin clean while leaving it feeling soft. Normally I am not a huge fan of facial products with botanical-like scents/ingredients (as many times the scent can be overwhelming). Yet, I absolutely love the soft and slight hint of lavender in this face wash! I really adore this face wash! I use it a number of ways: either on its own with my fingertips, with a device (lately it is either my Foreo Luna or my Michael Todd Skinsonic), or mixed with LATHER's amazing Facial Polishing Powder (see below!). My skin LOVES exfoliation. Seriously! The older I get, the more I realize that effective, yet gentle, exfoliation is the key to keeping my skin clear and looking fresh and young. Plus, when your skin is exfoliated, your treatment products absorb better! This Facial Polishing Powder is a super unique mechanical exfoliatior that you mix right into your cleanser for an exfoliating boost! It is a blend of ground bean, nut, rice, and fruit powders. You can actually mix this on its own with water or add it to your favorite cleanser (I adore it with the Ultra Mild Face Wash as a mix-in!). 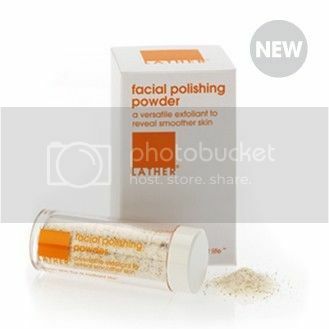 This Facial Polishing Powder really does give heavy-duty exfoliation with its ultra gritty scrub. The trick is that you really have to be gentle with it. Just lightly glide your fingertips in circular motions over your skin (don't over scrub!). My dark under-eye circles are the bane of my existence! I struggle with them daily and rely on super-pigmented under eye concealers to disguise them. I am always interested to try products claiming to revive the eye area. This is a nice lightweight soothing and cooling eye gel. I primarily like it for its de-puffing abilities. For this reason, I prefer to use it in the mornings when my eyes look more puffy. It seems to have a toning/firming effect on the eye area. It is super gentle and totally non-irritating. Vitamin K is known to help decrease the appearance of dark circles. While I have not noticed any major improvements in that area, I do still think my eye area is somewhat "brighter". Perhaps just a "surface brightening". 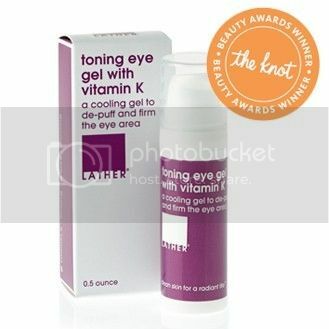 I like using this eye gel in the mornings and a more hydrating cream at night. Sometimes I layer an eye cream over this eye gel in the mornings if I feel that I need extra moisture. Have you tried anything from LATHER? I would love to hear what you recommend! I especially want to try some of their bath & body products next!